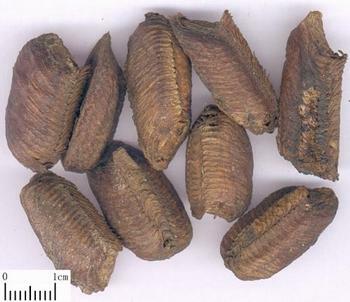 The egg case of Tenodera sinensis Saussure, Statilia maculate (Thunberg) or Hierodula patellifera (Serville) of the family Mantidae. Called Tuan Piao Xiao, Chang Piao Xiao, He Piao Xiao respectively. Produced in most areas in China. Collccted from late autumn to spring. Kill the egg by steaming and sun-dried. Dry, whole, unhatched, yellow, light and tough, without impurities. Unprocessed or stir-baked with salt solution. Sweet, astringent, neutral; liver and kidney meridians entered. Secure essence and reduce urination, tonify kidney and strengthen yang. It can tonify kidney qi, and also strengthen essence gate and reduce urination. Therefore, it is an appropriate herb for seminal emission, spermatorrhea, enuresis, frequent urination and leukorrhagia due to kidney deficiency and it is especially skilled in reducing urination. For enuresis in children, frequent or difficult urination during pregnancy or afrer delivery, it could be used singly or combined with Long Gu to astringe. For seminal emission and spermatorrhea due to kidney deficiency, it is combined with astringents. For instance, it is used with Long Gu, Wu Wei Zi and toasted Fu Zi in the formula Sang Piao Xiao Wan from Shi Yi De Xiao Fang. It can tonify kidney and strengthen yang. For impotence due to kidney deficiency, it is combined with herbs such as Lu Rong, Rou Cong Rong and Tu Si Zi. It can tonify yang and astringe, so it is contraindicated in cases of yin deficiency with effulgent fire, and heat in bladder.